Hidden Figures tells the true story of three African-American women who worked at NASA in the 1960s. Their story is remarkable for many reasons – not only were they women working in a male dominated research environment – they were also working in a segregated America where Black people weren’t allowed to attend the same schools as white people or even share the same public toilets. Their achievements were relatively hidden until recently – hence the name of the film Hidden Figures. From a mathematical point of view one of the most astonishing aspects of the film is that the women were calculating space trajectories by hand – for a modern audience which is used to calculators and high powered computers it is incredible that these women did calculations with pen and paper which put an astronaut into space. The three women begin their careers in the film as human computers – working in an all female section for coloured women which carries out mathematical calculations by hand. The main character Katherine Johnson is temporarily assigned to an all male research team where her prodigious mathematical talent means that she eventually is asked to personally calculate the trajectory of the first US astronaut to orbit the earth, John Glenn. You can really feel the tension while watching the film – not only was John Glenn’s life depending on Katherine Johnson’s mathematical calculations – the entire country was in a space race at the height of the Cold War – Johnson’s calculations had massive political significance as the US competed with Russia to be dominant in space. 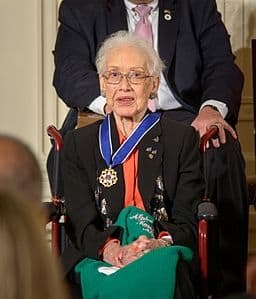 Fortunately, the main character in the film Katherine Johnson has at least lived to see some recognition of her achievements and in 2015 she was awarded the Presidential Medal of Freedom by Barack Obama, when she was 97 years old. In 2016 NASA also named a new $30 million research facility the ‘Katherine G. Johnson Research Facility’ in her honour. The film leaves you feeling overawed at the genius of these women who were doing calculations which fired the first US citizen into space. Hidden Figures is not just aimed at those who are interested in maths and space – it has been a big box office success grossing so far over $160,000,000 in the US and has been nominated for 3 Oscars. It has a broad appeal – tackling issues around women’s rights, racial segregation and championing the idea that anyone can be good at maths and science. It is also a feel good film with a bit of romance thrown in which will appeal to a wide audience. Of course there are some bits which have been hammed up by the screenwriters (it was unlikely that Katherine Johnson was completing her calculations seconds before John Glenn was due to be launched into space) however this all just adds to the drama and doesn’t take away from the fact that these women achieved something truly amazing.